Creating a new calendar each month is a waste of time, but many people do as they think they need to rebuild it to get correct weekends and public holidays. But in fact, with few formulas, 2 conditional formatting rules, 1 dropdown list and 5 lines of VBA code, you can create an automatic calendar. What is the cell link? 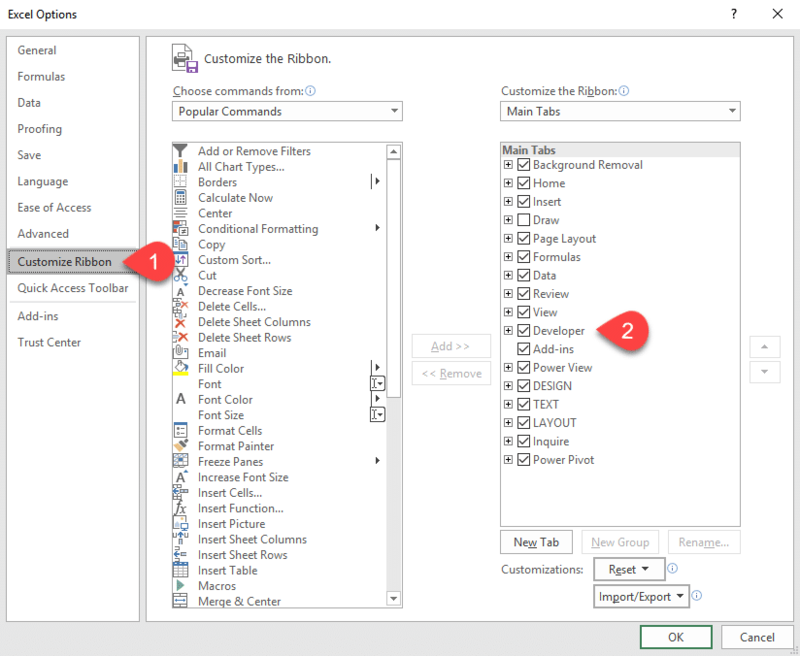 Then left click and drag your mouse to create a drop-down objet in your worksheet like in this picture. In my case I have to create this list 32 columns away from my source data (maximum number of day per month + the column of the employees' name). Now, connect the Combo Box with this list of month. The Format Control dialog will open. 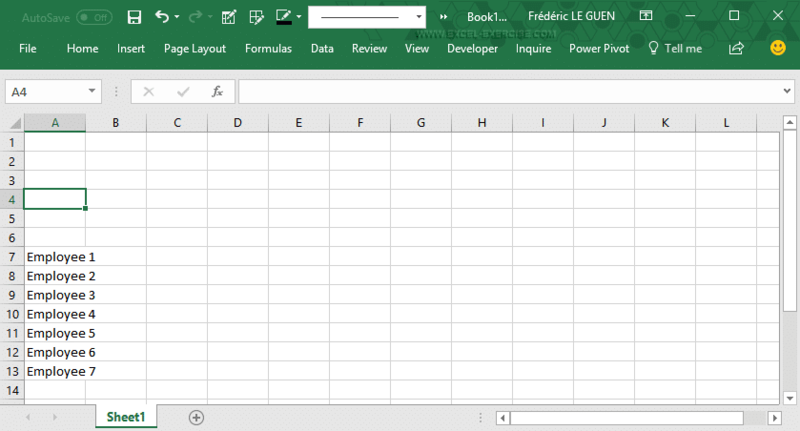 The Cell link is the cell that will collect the value of the index of the element selected. Why choose A1? It's tricky  In fact, the drop-down object is above the cell A1. Like that, the end-user will not see the result of the cell linked. The location of the Cell link is crucial for the rest of the explanation. 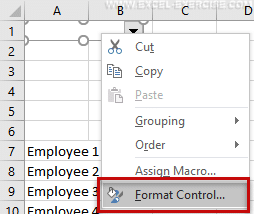 It has in impact on the formula DATE and with the macro. 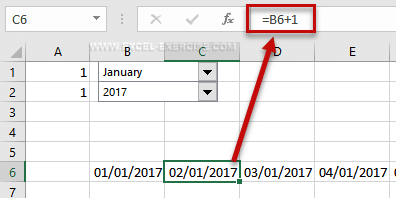 Here, we are going to re-used the contains of A1 (month selected) and A2 (year selected) and put them in the DATE function. If you are not familiar with the DATE function, have a look at this article. So, let's create the first day in function of the value of the drop down object. This step is very easy. We just have to add 1 to the previous cell to increase your series of days. Now we are going to focus on the date format. We already have the year and the month in the upper left corner, so we don't really need this information in our cells. What we need, it's just to display the days of our dates. To do this, we can change the format of the date in the row 6 to display only the day. We want to display the short name of the day and also the figure. Enter ddd dd in the Type field. Then, adjust the size of the columns B:AF to get this presentation. Now, we are going to create a dynamic title with the first and last day of the month. And to customize the result, we must include these 2 formulas in the TEXT function. 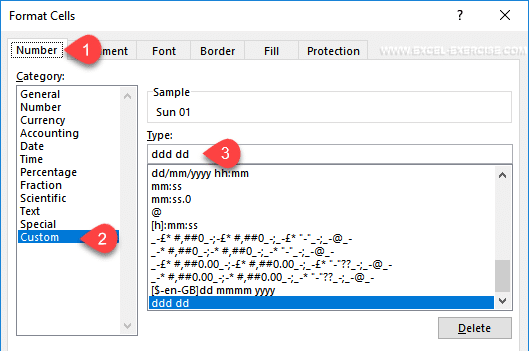 The parameter of the TEXT function is the format of the date you want. The WEEKDAY function returns a value between 1 and 7 corresponding to the day of the week. So, we build a test with this function to know if the day is a week-end of not. Very, very, VERY IMPORTANT ⚠⚠⚠ There is only one $ in the formula after the column (B) and before the row (6). This is because, the condition must always "read" the value of the day. Read this article about the reference mixed or this one about the reference absolute to know how to use the $ in a formula. Here, we use the COUNTIF function. If one of the day is in the list of public holiday, the formula returns 1. So, we test if the formula returns a value greater than 0. To finish, we must create a macro. The calendar is build with 31 days. So if we selected a month that hasn't 31 day, the calendar will not be correct. So we are going to create a macro that will hide the days not include in the selected month. To finish, we link the 2 drop down objects to this code. Now, each time you select a month in your drop-down list, your calendar will automatically change the color of the weekend, holidays (providing your list is up to date, of course) and also hide columns as necessary. I did the same as in exemple, except the macro couse in the first cels were you have link the mounth and the year i have to put the company name and adress wich is mandatory, so i had to move the linked the mounth and year to AG 1 and AG 2, and here is my problem, i try to change the macro but didnt work , may you please help me or tell me what to change in macro to work ? Regard the rest of the stepts worked perfectly. Could you please explain the code you've shared on Step 11. As I change the month from January to February & February (to either of the month with less than 30 days) the hidden column will not appear anymore as it is always hidden even if I go to the month with 31 days. I tried also the same code you've provided, still the same scenario. I have found exactly what I want. I am still wondering if its possible to not clear the contents when moving the calendar forward. I use the calender as a way to keep track of my employees vacation. But when they type x in a date, lets says 1.7.2018. The x will then stay in that cell when i change month and year... Did you solve this? Thank you for providing such an wonderful article. I tried my level best in preparing one of the daily update sheet for my employees based on the inputs provided by you. But when I am writing something in the month of January the same thing is repeating in all the months unchanged. How can I erase or hide the content of that particular month and start afresh in next month. Kindly, help me in this regard. Thanks for this fantastic video and help. I and wondering if its possible to not clear the contents when moving the calendar forward. For example when my team enters their availability for July 2018 and August. Switching back to July all the contents clear. The workbook doesn't save the previous values. To do that, it is compulsory to create a real program and it's not the purpose of the post. Can you please share the code to public. I have successfully made an automatic calendar (for meeting purposes) using your tutorial, however when I try to add the meeting title into the row below dates, in the correct date column it doesn't seem to change when the month changes it stays in the same position across the whole calendar. I hope this makes sense could you direct me on how to fix it please? The tutorial was great btw. I'm also having the same issue! I've spent so long working on this and I cannot work out how to get this to work! I use the calender to keep track on my employees vacation. But when they type in "x" in a given cell. It follows that cell when i change month or year. Hope there is something we can do about this. Many thanks for your website. Hi, thank you for the great template. I want to use it to book functions/events in the future, how can the macro be adjusted to allow me to move into different dates and years without loosing the information? At the moment when I move from June to July, all of the information in June disappears, removing the ClearContents instruction results in the information appearing in any month you select. Hi Thank you for the post! It has been really helpful... I am having the same issue when changing from Jan to Feb... All of the information from Jan will past into Feb.
That's strange because the instruction to clear the contain of the range B7:AF13 is written in the code. Hi Frederic, thanks for the tutorial. Is there something we can do to retain the data that has been input into cells when months are changed? I am using this as a communications planner and would like to be able to retain the data as we switch through months. Is this a possibility? Yes it's possible but it's a really program to manage new entries, change values, delete previous record and display previous month values. For me it's minimum 2 days of development. I've made my own version but can't figure out how to do step 11 (Hide the last columns with a macro). In my case I didn't make the calendar in columns, but in rows, and made a different layout than yours. I can't figure out how to do make the macro so it can work on mine. I still haven't had a breakthrough with my previous answer. Could you please help me? You can also write me an email, so you don't give away some of the answer for the paid part. however I did have trouble trying to change the formula for the weekend highlight see where I am the weekends fall on a Friday and a Saturday can you advise what I should do in this case? There is no reason. If you have properly follow the explanation it works. Maybe your DATE formula is not linked to the dropdown cell. does this method for creating a calender automatically accomodate february when 28 days vs 29 days. or what is the code to add to compensate and visibility when february is selected to only show the dates required for the full month? It's superb and also i have created the same but if i will change the month data against the employee still the same how that will get change? thank you for great calendar. I've added here also combo box with years. Unfortunately years are read as serial numbers. Could you give me a hint how to solve that? i really liked you design, can you share the template ? It has been made from scratch and it's not downloadable.